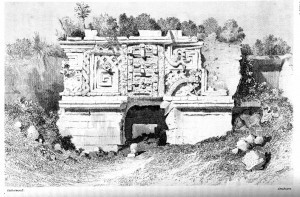 How ruinous should a ruin be? 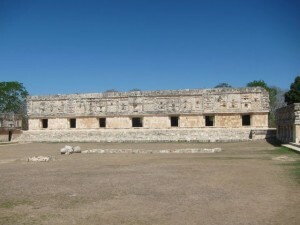 As I visited Uxmal, I noticed the contrast between the ruins that Stephens described (and lived in) and those that I saw. The stones used to be a jumble, but today the monuments are consolidated, restored and reconstructed. 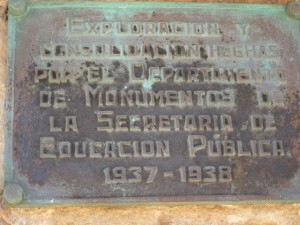 For instance, the Mexican government’s Departimento de Monumentos de las Secretaria de Educacion Püblica restored Las Monjas (the Nunnery) in 1937-1938. Restoration work conserves monuments and protects them from the elements and tourists (who are very hard on sites). Some restorations are better than others, but all belong to a particular moment in time and attest to its archaeological understanding of the remains from the past. 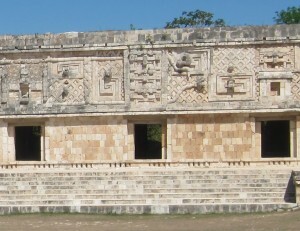 It’s important to note that the ruins at Uxmal are not only the work of the Maya. They are also, in part, the work of the scholars who excavated and studied them. What the tourists see is a sort of museum display, that is, a ruin that has been studied, cleaned up, put back together, and presented to them by modern archaeologists.